On the afternoon of January 22nd, the Archmere boys' swim team raced against St. Mark's at the Walnut Street YMCA, defeating the Spartans 108-62. Archmere came out strong, beginning with a first place in the 200 medley relay. The members of that team were Joseph Marino '21, Jacob Piretti '21, Julian Iacono '19 and Max Iacono '21. 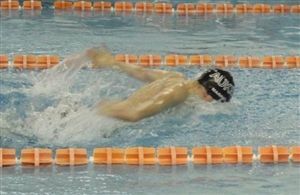 The Dialog writes of the boys' efforts, "Piretti won two individual events, the 200 freestyle and the 100 breaststroke. Marino also was a double winner, taking the 200 individual medley and the 100 backstroke. Julian Iacono won the 100 butterfly, while the team of the Iacono brothers, Piretti and Nathan Hendrixson captured the final event, the 400 free relay."